We’d love your help. Let us know what’s wrong with this preview of Watching the English by Kate Fox. To ask other readers questions about Watching the English, please sign up. Has anyone read this. Is is humorous? Recommended? I really enjoyed "Watching the English" by Kate Fox. I'm wondering if there is any books of the same caliber on other countries / cultures? Leigh The Almost Nearly Perfect People is pretty good for Scandinavia. Humourous but informative and offers pretty balanced views. If only there were a book like this for every country and people! It has been a long time since I have laughed as much while reading a book... and I'm not sure that I have ever read so many excerpts of a book out loud to my wife. 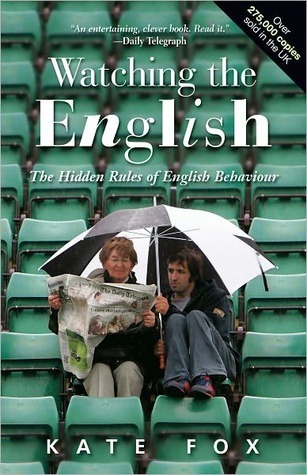 If you have ever wondered why the English behave the way they do, then run (do not walk) to buy this book. Kate Fox is an anthropologist after my own heart (when I went on an expedition, it was through the Alps rather than the Himalayas) -- uninterested in the "macho" o If only there were a book like this for every country and people! It has been a long time since I have laughed as much while reading a book... and I'm not sure that I have ever read so many excerpts of a book out loud to my wife. If you have ever wondered why the English behave the way they do, then run (do not walk) to buy this book. Kate Fox is an anthropologist after my own heart (when I went on an expedition, it was through the Alps rather than the Himalayas) -- uninterested in the "macho" obsessions of her colleagues who are forever rushing off to suffer in jungles and deserts in order to elucidate the obscure beliefs and rituals of minor tribes, she has chosen to focus on the much larger but just as bizarre tribe that lives outside (and inside) her house: the English. And they (we) really are bizarre, when you really pay close attention to them (us). Her method is that of the participant observer, forever eavesdropping in pubs, trains, buses, cafes, and wherever else she can, formulating theories about rules that would explain the strange behaviour she witnesses, and then testing them by clever questioning of, and ingenious experiments on, mostly unsuspecting "informants". Her writing is brilliant: acutely intelligent and ferociously funny. And in my opinion she succeeds in her goal -- identifying the cultural "genome" of the English. After reading "Watching the English" I feel like I understand both my countrymen and myself much better than I did before. I can't recommend this wonderful book highly enough. I'm a big fan of BBC Radio 4 and this is how I first heard of Kate Fox's work on social anthropology. If you are interested, listen to her talk on social and cultural aspects of alcohol. Her ideas were so thought-provoking and engaging, that I couldn't have passed this book. The task of working out a basic formula of what makes up a national character seems incredibly complex, if not impossible. Luckily, Kate is a trained anthropologist who is more interested in discovering the unwritten rules go I'm a big fan of BBC Radio 4 and this is how I first heard of Kate Fox's work on social anthropology. Чудова книжка, щоб зрозуміти, наскільки ти сам англієць. Best ever подарунок моєму англофільству. Він дав зрозуміти, що це не просто так. Мені страшенно імпонують багато рис цієї нації, попри їхню дивакуватість. Проблеми з соціалізацією, надмірна ввічливість, страх порушити особисту територію, любов до псів, читання і садків. І звісно дивне почуття гумору. Кейт Фокс випробувала усе це на власних земляках, і дала пояснення. Це дуже дотепна книжка. Усім фанам англійськості, як бальзам на душу). This book was sent to me by my English publisher, and it took me a while to read as I made it my daily breakfast reading instead of my leisure reading. For anyone who has traveled in England and experienced some of the unusual aspects of the English "character" -- such as never, upon pain of death, make eye contact with someone on the Tube--this is an amusing read as the author, a social anthropologist, tries to work out why her fellow countrymen are as they are. Great fun to read. Now I understand why I'm such an anglophile; I'm a quirky English soul stuck in an American body! If I ever get across the pond, I think I'll fit in better then not. I think this would be an excellent book for any foreigners coming to live or work in England, (even Americans, who might think we share a similar culture). The author’s introduction sets the stage well, describing her aims and methodology, and her final chapter is a thorough synopsis of the ideas she expands upon in the book. I think one definitely needs to read the whole thing though. It offers the reader a chance to really wallow in our ways of living, and ways of presenting ourselves to the w I think this would be an excellent book for any foreigners coming to live or work in England, (even Americans, who might think we share a similar culture). The author’s introduction sets the stage well, describing her aims and methodology, and her final chapter is a thorough synopsis of the ideas she expands upon in the book. I think one definitely needs to read the whole thing though. It offers the reader a chance to really wallow in our ways of living, and ways of presenting ourselves to the world. Gauche, snobbish, polite and hypocritical.... private, self-deprecating and humerous..... DIY, gardening and animal crazy - Kate Fox prizes open our tightly clamped shells and exposes our habits and eccentricities to the light of the anthropologist's gaze. I skim read a bit in parts – mainly because I was so familiar with the idiosyncrasies and ‘ways of being’ that she describes. I also laughed on several occasions.....we have some really ridiculous foibles, and the author describes them well. We use it for social interaction....to groom one another, like monkeys’ grooming one another physically. This is profoundly reassuring, even for non-believers. It’s a ritual which illustrates a deep need for a sense of safety, security and continuity. Some ethnic minority groups have adopted more English customs than others. Englishness is rather more a matter of choice for the ethnic minorities in this country that it is for the rest of us. Individuals quite consciously, deliberately, cleverly and even mockingly pick and choose among the behaviours and customs of their host culture. But of all people the English are historically surely the least qualified to preach about the importance of adopting the host-culture manners and mores. Our own track record on this is abysmal. We not only create pockets of utterly insular Englishness (when we go abroad), but also often attempt to impose our cultural norms and habits onto the local population. Recent research shows that 2/3rds of our conversation time is entirely devoted to social topics, such as who is doing what with whom…… who is ‘in’ and who is ‘out’, and why. ….how to deal with difficult social situations….our problems with friends, family, colleagues and neighbours. Gossip about soap operas and celebrities is almost identical to the above. Men have been shown to gossip just as much as women. Because we are so private our gossip has a particularly high value. “Private” information is not given away to all and sundry. It is valuable. The English are much more outspoken in print and on the media than they are when you talk to them face-to-face. Confessional journalism is fine. Talking personally about your private life to someone you meet at a party is not. The English place a very high value on humour, and in general conversation there is usually an undercurrent of humour. We would never tolerate the gushing earnestness and pompous, Bible-thumping solemnity favoured by almost all American politicians. Most of all it is their earnestness that makes us wince. We like irony, understatement and self-deprecation. Phew, our concerns about this are endless, especially amongst the aspirational middle classes. We love words, and words are our preferred medium. Speech is therefore our main way of signalling status. Other ways include taste in clothes, furniture, decoration , cars, pets, books, hobbies and food and drink . This has enabled us to return to the easy, spontaneous, casual style of conversation that would have characterized the small communities for which we are adapted by evolution. It has become the modern equivalent of chatting over the garden fence, or at the village green. The more desirable your residence the more you must emphasis the troubles and inconveniences involved in its acquisition and improvement. Done well, this air of long-suffering humour will successfully deflect envy and even arouse sympathy. We have a mania for nest-building. Jeremy Paxman says “Home is what the English have instead of a fatherland”. We are neurotically obsessive about our homes. Gardening and DIY are major hobbies here. 100,000 books a year are published, and we print more newspapers per head than practically any other country. We adore and exalt them. This must never be done overtly. It is far better to criticise them, whilst at the same time slipping in that they are a genius, brilliant at sport, fantastically popular or whatever. Hypocrisy (We are incredibly polite, and thus often hypocritical. We tell people what they want to hear). Eeyorishness (We do like bonding over a good moan). Class-consciousness (We have an acute sense of people’s class and background). Anthropology practised on the English. The author claims that this was to just avoid the discomfort involved in studying peoples in obscure and isolated parts of the world - but she also tells us that humour is the default mode of the English and that modesty is one of our values. Having put us at our easy with a friendly joke and a humility topos she is able to smuggle her research past the reader and show us just how alien the English are. Which is a nice way of demonstrating the value of her Anthropology practised on the English. The author claims that this was to just avoid the discomfort involved in studying peoples in obscure and isolated parts of the world - but she also tells us that humour is the default mode of the English and that modesty is one of our values. Having put us at our easy with a friendly joke and a humility topos she is able to smuggle her research past the reader and show us just how alien the English are. Which is a nice way of demonstrating the value of her work. I had flicked through the book in the past. You see a brief mention of class, read it, sniff haughtily and say to your self - I could have told you that. However reading from cover to cover, starting with Fox's core idea of English social unease (or dis-ease as she calls it throughout) is a different matter and she builds up a solid case. I would have liked to have seen more on the differences between different regions - or to have my belief that regionalism is significant disproved. A nod to how far her argument could or could not be extended to the Scots, Welsh and Irish would also have been interesting. But on the whole I'm taken with her notion of reserve as the flip side of loutishness and both as symptomatic of social uneasiness. There's a lot here to make it a worth while read for the non-English obliged to live in England or work with the English, and there's a lot to be said for being able "To see oursels as ithers see us!" She touches on everyday situations and how the English have "rules" which govern how one should act......and she lists these rules by class without being demeaning. She covers such things as talking about the weather, pub talk, rules of the road, excessive privacy and much more. I have actually observed some of these rules in action while in England but obviously was unaware of others and acted "inappropriately" which may have caused my English companions to react with the typical English sign of disfavor, the raised eyebrow! I really loved this book. First of all, it's hilarious--not because she's writing humor, but simply because it turns out that it is surprising and amusing to have basic human behaviors picked apart. Second, she is very accurate and the information could actually be useful in future interactions with English people. I feel that Fox is very skilled as an anthropologist to have been able to identify these traits in any culture, much less in her own culture. But she still keeps the book's style very I really loved this book. First of all, it's hilarious--not because she's writing humor, but simply because it turns out that it is surprising and amusing to have basic human behaviors picked apart. Second, she is very accurate and the information could actually be useful in future interactions with English people. I feel that Fox is very skilled as an anthropologist to have been able to identify these traits in any culture, much less in her own culture. But she still keeps the book's style very casual so it is quite readable, not academic at all. It almost feels like a conversation. Ох, яка цікава і довга подорож! Беззаперечно, рекомендую до прочитання, як мінімум через те, щоб відкрити в собі англійця. І зрозуміти що ж таке з тими англійцями? 😅 Авторка провела колосальну наукову роботу - спостерігаючи за своїми співгромадянами намагалася крекнути код та пояснити всі особливості та причинно-наслідкові залежності поведінки. Вийшло - просто, науково+ з гумором. This started well enough, with some amusing and perceptive points about how the English greet each other (or rather, don't) and converse. But it soon falls into the typical trap for this kind of book, and one which Fox herself warns against in her own introduction: generalisations. Time after time she'd assert that English people do X, to which I'd reply in my head "Well, no, I don't". She's also obsessed with class. She claims that all the English are, but she seems to think about it an awful lo This started well enough, with some amusing and perceptive points about how the English greet each other (or rather, don't) and converse. But it soon falls into the typical trap for this kind of book, and one which Fox herself warns against in her own introduction: generalisations. Time after time she'd assert that English people do X, to which I'd reply in my head "Well, no, I don't". She's also obsessed with class. She claims that all the English are, but she seems to think about it an awful lot more than I ever did. I skimmed whole chuncks of the chapters on houses and cars because, rather than analyse what we do with them and why, she's content to produce long lists of terms, products and brand names and then assign them to particular classes. I couldn't really care less whether she considers a certain model of car to be lower class, lower-middle, middle-middle- upper-middle or upper class. I am the type of person that likes to learn everything about whatever new endeavour I've taken up, so the intended purpose of reading this book was to learn more about my new country. Although the book had its moments - discussions of queuing, pub etiquette, social dis-ease food, and the weather were among the highlights - I found the obsession with class deeply off-putting. Fox is clearly from the upper-middle or upper class, and most of her discussions of 'distinctive' English characteristics I am the type of person that likes to learn everything about whatever new endeavour I've taken up, so the intended purpose of reading this book was to learn more about my new country. Although the book had its moments - discussions of queuing, pub etiquette, social dis-ease food, and the weather were among the highlights - I found the obsession with class deeply off-putting. Fox is clearly from the upper-middle or upper class, and most of her discussions of 'distinctive' English characteristics are broken down by class. She tries to play the role of participant and objective observer, but clearly shows her own biases across the book (and a disdain for the working classes). Honestly...if English people pay as much attention to class as she says they do (still), then I find it incredibly depressing. I've walked away from this book feeling very fortunate that I've never given a thought to my class, and frustrated that this sort of nonsense lives on. While the book is over 400 pages of an anthropologists observations on Englishness, and begins with a rather good discussion of the strengths and weaknesses of participant observation, I am highly skeptical of most of Fox's conclusions. There are many problems, but the chief one is that you cannot define what it is that makes the English *distinct* without comparing it to other cultures. She makes a half-hearted attempt in some places, but mainly she just resorts to the lazy approach of comparing the English to Americans. Most of what she said about American culture didn't ring true to me either, and I am not sure how living there for 4 years as a child can make her an expert. Surely there was more scientific research she could have used to really tease out what characteristics were just human or maybe just Western - and which were truly, quintessentially English. The other problem is that she simply tries to cover too much, without any evidence to back it up. There's little information on her methods, other than the introduction on participant observation, and very few references. It's hard to believe this is anything more than a summation of her view of the country in which she's grown up. Sure she's commissioned to do this sort of research, but would it be so difficult to give a bit more information about how you know your observations are accurate, reliable, and - perhaps most importantly - meaningful? I would like to throw a tea party for Fox, complete with coasters, napkin rings, and chip butties...just so she can judge me and tell me what my class is. As for the rest of her countrymen and women, I suspect they are not nearly as class-obsessed as she is, and I've walked away still feeling like she got lost in the 'ethnographic dazzle' (her own term) of class distinctions, while failing to capture what it really means to be English. I felt Notes from a Small Island did a much better job than this book, and I would much sooner recommend that, which has no illusions of being an academic study of the English yet more successfully summarises the essence of Englishness. At its worst, anthropology can be extremely condescending, analyzing other cultures as if they were animals. But at its best, the discipline explains the very meaning of what it is to be human and live in human society. Fox neatly sidesteps the first to embrace the second by turning her trained gaze on her own culture. And so we get an examination of why one doesn't speak to fellow commuters, the English substitution of home pride for social skills, the liminality of the pub, and pea-eating's rol At its worst, anthropology can be extremely condescending, analyzing other cultures as if they were animals. But at its best, the discipline explains the very meaning of what it is to be human and live in human society. Fox neatly sidesteps the first to embrace the second by turning her trained gaze on her own culture. And so we get an examination of why one doesn't speak to fellow commuters, the English substitution of home pride for social skills, the liminality of the pub, and pea-eating's role as a shibboleth. She narrows down on the English view of the world, an attitude that assumes everything will turn out poorly but one mustn't complain, in which humor and not appearing to take anything too seriously are of paramount importance. And because she herself is English and cannot help herself, she writes the entire thing with a self-depricating wit that is delightful. There are breakdowns of the class meanings of what time someone eats dinner, what they call a meal in the later part of the day that has tea involved, and what specific departments someone buys things from in Marks & Spencer. Given that American culture has some parallels but fewer strong definitions for class, it's a fascinating comparison. Read it around 10 years ago after my first visit to UK. Maybe I should read it again and try to find an explanation for what happened last week. I read this book because an english person came into the store and bought it, and I figured, I wouldn't buy a book like this on america so it must be good. Now it certainly didn't hurt that John is also English and that Barsby yelled at me for commenting that he sounds like Ringo star (I hold fast he does, this is not a british thing on the basis that I do not think any other people sound particularly like Ringo star,only Barsby). Moving on, basically I read this book and I was vindicated, the b I read this book because an english person came into the store and bought it, and I figured, I wouldn't buy a book like this on america so it must be good. Now it certainly didn't hurt that John is also English and that Barsby yelled at me for commenting that he sounds like Ringo star (I hold fast he does, this is not a british thing on the basis that I do not think any other people sound particularly like Ringo star,only Barsby). Moving on, basically I read this book and I was vindicated, the book is hilarious, the author spends a good deal of time making fun of bill bryson, which I'm sure he would appreciate and just generally making fun of British people while still managing to sound pompous when discussing how the colonies do it. I thought the depiction of America was commonly very flawed, but it was a small part of the book a contrast not a topic and she has not spent nearly as much time studying it, although her sister is "American" so I forgive her. Just as Bryson cannot get inside the British mind she seems inherently unable to get inside the American mind. British teenage girls are much better (or worse depending who you ask) at losing their virginity than Americans. England has the highest teen pregnancy rate in Europe. Growing up in rural New England is a bit like growing up in england sans the class structure and possibly with a slightly less developed sense of humor. English people are always lying liars. Upper class english people eat peas in the most inefficient manner possible. honestly chopsticks would be easier. English men think being born male is a possible sign of homosexuality (okay that is an exaggeration, but basically the only things that appear not to be signs of homosexuality are buying rounds and swearing). British people do not tend to watch too much TV. British people like the internet because it allows them to interact with people without interacting with people. the british women's obsession with Bingo. Why it is insulting to be compared to Ringo star. why upper class children have stupid names. Some of the names are included but no explanation of why a parent would name a child Saskia. all in all worth a sit down. I'm South African, meaning warmer than the English and nicer than the Australians, or so I always thought. Reducing whole nations to a few characteristics is a dangerous game, but never feels more right than when done by Kate Fox, an anthropologist whose keen intellect shines through this book, despite her commendable repudiation of academic jargon and pretension. With typically English humour and modesty (or so her book would have it) she explains her project, an anthropological survey of domes I'm South African, meaning warmer than the English and nicer than the Australians, or so I always thought. Reducing whole nations to a few characteristics is a dangerous game, but never feels more right than when done by Kate Fox, an anthropologist whose keen intellect shines through this book, despite her commendable repudiation of academic jargon and pretension. With typically English humour and modesty (or so her book would have it) she explains her project, an anthropological survey of domestic English life, as merely the laziest and safest option available. In short, she sees the single defining core of the English as "social dis-ease", in response to which they have developed a number of coping mechanisms - primarily an all-pervasive sense of humour, and a strong belief in courtesy (often manifested 'negatively', i.e leaving people alone). She identifies English values such as common sense, a tendency to 'Eeyorish' gloominess (the "typical!" syndrome), and a powerful class-consciousness (though it isn't acceptable to talk about this last one publicly). I have to say that Fox is incredibly observant. The sheer power of her observation of the details of the English way of life makes this book a very entertaining read and makes up for her lack of (the well-advertised) English wit and humor (she tries, though). Obviously, anything that she says about the English is just an over-generalization and can be contested by many contrary examples – but that’s just an unavoidable part of doing anthropology. She lays out a few basic rules of Englishness, and then tries to explain different aspects of the English life according to those rules. And it works rather well. You feel like you’re reading a scientific theory of the Englishness that is well-supported by the evidence. There are things about the English that I personally like and they suit me well. I have no problem with their stereotype of being reserved and buttoned-up. While there’s some truth to this stereotype, it’s not as bad as others make it out to be. I find the English “reservation” more tolerable than the forced smiles and affected friendliness of Southern California. The English have the good sense of considering any gushing outpouring of sentimentality to be embarrassing and uncomfortable. No one is allowed to take themselves too seriously here – I’ve noticed this fact myself and very much like it. The serious and self-important tone of American business executives and the hand-on-heart speeches of American politicians who act like they really believe themselves will only make people roll their eyes here. And then there are things that I like less, but I’ll be a good guest and keep quiet for now. Overall, this is a really great and amusing book for anyone who lives in England (including the English themselves) or is interested in the English people. The introduction about the theory of doing anthropological research was very interesting to me as well. A charming yet misfigured look at English social codes. The peculiarities of English behaviour are so greatly extrapolated that the other side of the Channel sounds almost like a different planet. In practice, a basically well-mannered & polite foreigner with an erudite dash of Anglophilia feels welcome. Some sections are hard to follow unless you are English. Many habits come off as small town/suburb ideals that don't hold up in the inner big city. And just as many are unfortunate reminders A charming yet misfigured look at English social codes. I have a confession to make - am an anglophile, and on top of that, an anthropologist at heart, so I could have given this book five stars only for the title…But it has so much more to offer then the title. ‘My father - Robin Fox, a much more eminent anthropologist - had been training me for this role since I was a baby (...). I was only five, but he generously overlooked this slight handicap: I might be I have a confession to make - am an anglophile, and on top of that, an anthropologist at heart, so I could have given this book five stars only for the title…But it has so much more to offer then the title. Once grown up and anthropologist herself, she chose to observe her own culture, rather than foreign and far-away tribes in the amazon jungle. After a number or research project investigating behaviours in pubs, horse races and clubs, full of disorder, violence and aggression, she decided to turn to good and positive behaviors instead. Her aim in ‘Watching the English’ was to provide a ‘grammar’ of English behavior and write a book for a so called ‘intelligent layman’. Since as I already confessed, I am only a wannabe in both fields, I cannot judge if her observations were well executed and conclusions correct, I cannot judge her objectivity either. I can only express my enjoyment and my absolute delight with this book. The unwritten rules are everywhere and through Kate Foxes mercilessly humorous eye we receive an analysis of rules of how to talk, what to talk about, what words to use, how to behave at home, at work, on public transport,how to interact, what to wear and how to wear it, how the rules differ among the different social classes and not the least, the role of irony and how important it is to never lose your sense of humor. I learned a lot and I laughed a lot and I wish I knew all that when I actually lived in England. So I would like to highly recommended it, if your are anglophile, if you are English, or if you are not, but would like some help with passing for one….. This was obviously a good idea formulated in a pub. I will go so far as to say it would have made a fascinating 'long read' magazine feature. Or perhaps a *short* book. But it went on too long and the joke wore thin, and then ran out of steam. In fairness, she did caveat several of her observations, and did remark at length on class differences - too much length. Sure I recognised the characteristics she described. But there were so many broad brushed generalities that didn't really stand up. Or a This was obviously a good idea formulated in a pub. I will go so far as to say it would have made a fascinating 'long read' magazine feature. Or perhaps a *short* book. Sure I recognised the characteristics she described. But there were so many broad brushed generalities that didn't really stand up. Or assumptions. for example, you can't write at great length about pub behaviour without noting that large numbers of people never or seldom go to any pubs, or that there are different types of pubs (city centre, estate, village etc) and many people who frequently go to one type often avoid totally another type. In other cases I just feel there are so many exceptions that the generality doesn't even hold. All the rubbish about politeness and queues doesn't really hold any water. She failed to notice that England is a diverse society and increasingly so. As far as she is concerned, English people 'do' religion by being agnostically signed up to the Church of England. Well, that may be the case for some, but a great many more are Catholics, fervent non-conformists/Evangelicals, atheists (or utterly unengaged), or members (fervent or nominally) of non-Christian religions. This symptomises the book - there are elements of truth, but there are in all sweeping generalisations. Будучи страстной поклонницей Англии и всего английского, я просто не могла пройти мимо книги Кейт Фокс "Наблюдая за англичанами. Скрытые правила поведения". Долго вылавливала ее в интернете и наконец купила! (кстати, это была первая книга, купленная мною через интернет-магазин). Переплатила наверняка, ну да не жалею ни капли! Кейт Фокс - потомственный антрополог, взявшая на себя трудную задачу - определить скрытые правила поведения и особенности национального характера англичан, так называемую "г Будучи страстной поклонницей Англии и всего английского, я просто не могла пройти мимо книги Кейт Фокс "Наблюдая за англичанами. Скрытые правила поведения". Долго вылавливала ее в интернете и наконец купила! (кстати, это была первая книга, купленная мною через интернет-магазин). Переплатила наверняка, ну да не жалею ни капли! A great book to pick up and put down during my first months abroad. Much of being English seems to have to do with a fair amount of bumbling around and apologizing. No wonder I'm fitting in so beautifully. This is an excellent and comprehensive work of a brilliant anthropologist; it is both immensely and immediately useful, depicting a method of dissecting and presenting cultural codes in general, and entertaining as it provides a beautiful reference and observation point for the world of Englishness. I had been somewhat an Anglophobe before that book; now I understand the English better and learned to love the culture. jesus, who am I that it takes me nearly a month to read a book? my reading habits have changed considerably this year. anyway, one of those weeks I was on vacation, mostly staying in a hotel, with a tv, and my daughter made us watch cooking competition shows and catfished, so I did very little reading. despite my slow progress, 20 minutes at a time at lunch, I loved this book. I am a displaced english person who was brought up by english parents in the US, so I have read several books about engl jesus, who am I that it takes me nearly a month to read a book? my reading habits have changed considerably this year. anyway, one of those weeks I was on vacation, mostly staying in a hotel, with a tv, and my daughter made us watch cooking competition shows and catfished, so I did very little reading. despite my slow progress, 20 minutes at a time at lunch, I loved this book. I am a displaced english person who was brought up by english parents in the US, so I have read several books about english culture and behavior and this was by far my favorite. the author is an anthropologist, daughter of an anthropologist, and english, with years and years of studying english behavior under her belt. she basically examines the reflexes, outlooks, and core beliefs of english culture as revealed in all sorts of behavior - dating, drinking, working, celebrating, talking, etc. she's also funny. the takeaway for me is a curiosity about how much of my antisocial introverted personality is actually a function of being raised by english parents. my boyfriend is always saying, but you're not antisocial, you're perfectly capable of being social - maybe that's where the US upbringing comes in. it's interesting though, would I see myself as so introverted and antisocial had I grown up in england where people in general are less outgoing in their interactions with friends and acquaintances? it was also good in general just to get a read on cultural values. what looks from the outside like "coldness" may actually have much more to do with a high value on privacy. you don't ask people questions about themselves not because you don't give a damn, but because you're respecting their privacy. always good to think about the values behind our differences and lessen the judgement. the other interesting thing was that the author pointed out the similarity between the british and the japanese, which may in part be due to living on overcrowded small islands, hence the need for privacy and politeness, orderly queuing, etc. lot to think about. so, if you want to read a book about the english and how they are, I would recommend this over jeremy paxman's the english: a portrait of a people (she mentions him frequently, admires him, but I would say improves upon his points just by virtue of her more rigorous anthropology), and rules, britannia: an insider's guide to life in the uk. I've read this book first of all as an anthropologist and a follower of New Ethnography paradigm. But the hidden reason for reading this book was that I really love english people and I wanted an insider opinion of their culture and manners. Fox's attempt to free anthropology form Academia is a successful enterprise of humor and professional behavior and skills, well managed in the midst of collateral damages due to her position of 'native' as well as 'outsider ethnographer'. I really enjoyed th I've read this book first of all as an anthropologist and a follower of New Ethnography paradigm. But the hidden reason for reading this book was that I really love english people and I wanted an insider opinion of their culture and manners. Fox's attempt to free anthropology form Academia is a successful enterprise of humor and professional behavior and skills, well managed in the midst of collateral damages due to her position of 'native' as well as 'outsider ethnographer'. I really enjoyed the reading, especially the wonderful explanation of the 'understatement philosophy & ethology' so hard to understand for non-english people. It's an amusing ethnographer adventure in her own world at her own risks... and it's ridicolusly funny especially if you know the anthropological domain and code of behaviour. The sarcastic approach to the profession is greatly appreciated. Last but not least, being myself in the final year of a PHD in Anthropology, studying my own community here in Italy, the foreword pages illustrating the risks and collateral effects of the 'native' field and the poetics & politics of a final dissertation if you have not gone to the other part of the world to make your research, have been of precious support to me: as a phd student, as a native ethnographer, and as a woman. Kate Fox is a social anthropologist and Public Relations director. She is the director of the Social Issues Research Centre (SIRC). Fox is the daughter of an anthropologist Robin Fox (not to be confused with the famous historian Robin Lane Fox). As a child she lived in the UK, the United States, France and Ireland. She studied for an undergraduate degree in anthropology and philosophy at Cambridge Kate Fox is a social anthropologist and Public Relations director. She is the director of the Social Issues Research Centre (SIRC).